A good resource for starter corsets is Timeless Trends: http://www.timeless-trends.com - that's where my first few corsets came from. I currently get my corsets from C & S Constructions (http://www.candsconstructions.com/), who do custom work. Aside from my corsets, I make all my clothes myself. (I sew them entirely by hand.) I make my own patterns: To create these, I study the antique garments we collect, nineteenth-century fashion plates, and photographs. My favorite sources for fabrics are Reproduction Fabrics (www.reproductionfabrics.com) and William Booth Draper (www.wmboothdraper.com). My husband's clothes are custom-made for him by a Seattle seamstress (Katharine) who works at Hub and Bespoke (www.hubandbespoke.com). Question: My mother said that women wear corsets to impress men and not for themselves. Could you please debunk this? Answer: Regarding your mother's idea that women wear corsets for the sake of men, you might refer her to The Secret Diaries of Anne Lister. This is non-fiction; it is the diary of a real nineteenth-century woman which was recently transcribed and published. Miss Lister was a lesbian: She makes it very, very clear in her diary that she was not at all interested in men, but she wore a corset and wrote about repairing her stays. Women wore corsets for many reasons including back support. Generally, women were paying a lot more attention to corsets than men were! Here's a cute advertisement from the late 19th century which illustrates this rather nicely. 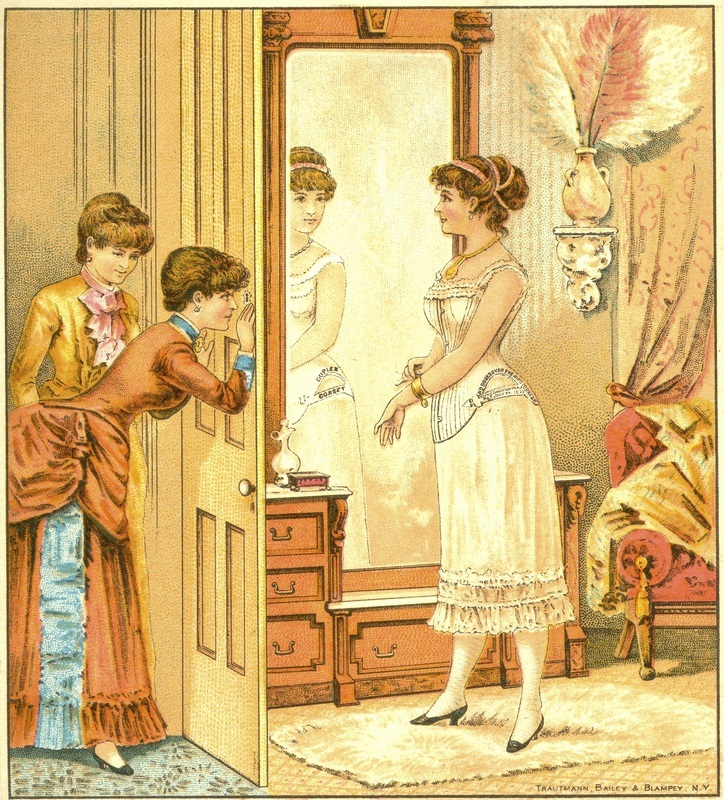 You'll notice that it's other women—not men—who are peeping into Mrs. Brown's dressing room to see her corset. "To speak of the subordination of woman's desire to men's fantasies is to apply a sociological model to the workings of the unconscious, one which overlooks its structural autonomy and negates the way in which fantasies circulate between subjects—the fantasy production of one inflicting that of the other." —Francette Pacteau, The Symptom of Beauty, quoted by Valerie Steele, The Corset: A Cultural History, page 135. Fan's question: Did you experience any muscle problems? Fan's question: My mother said I can't trust corset wearers about corsets, only doctors. How would you respond?